LANSING, Mich. - Cooley Law School Stadium will have a different look this winter, as Holiday Lights...Stadium Style makes its debut this year. Kicking off on Friday, November 16th, the stadium will feature a 360 degree walk around Holiday Light Show. 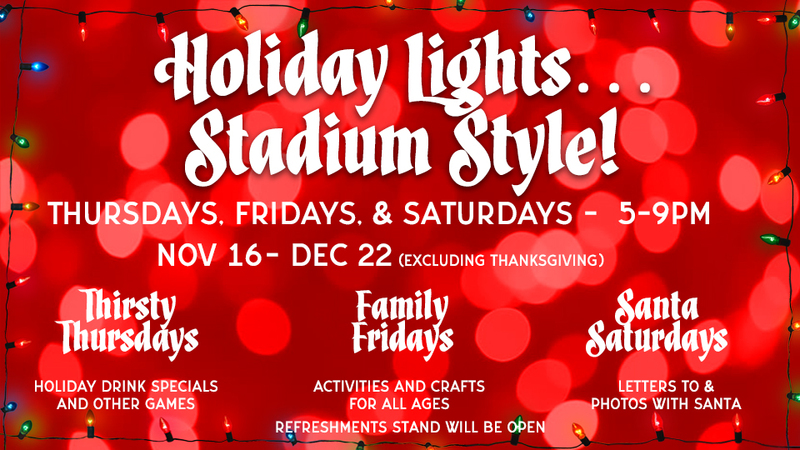 Open on Thursday, Friday and Saturday nights, Holiday Lights...Stadium Style will feature unique activities each of those nights. Gates open at 5pm and the show will run through 9pm. Tickets can be purchased HERE or at the Box Office on the day of the event. Admission is $5 per person, with children 6 and under receiving free admission. The Lansing Lugnuts are the Single-A affiliate of the Toronto Blue Jays. Members of the sixteen-team Midwest League, they have been a staple in Lansing since 1996. For more information on the team, visit LansingLugnuts.com.